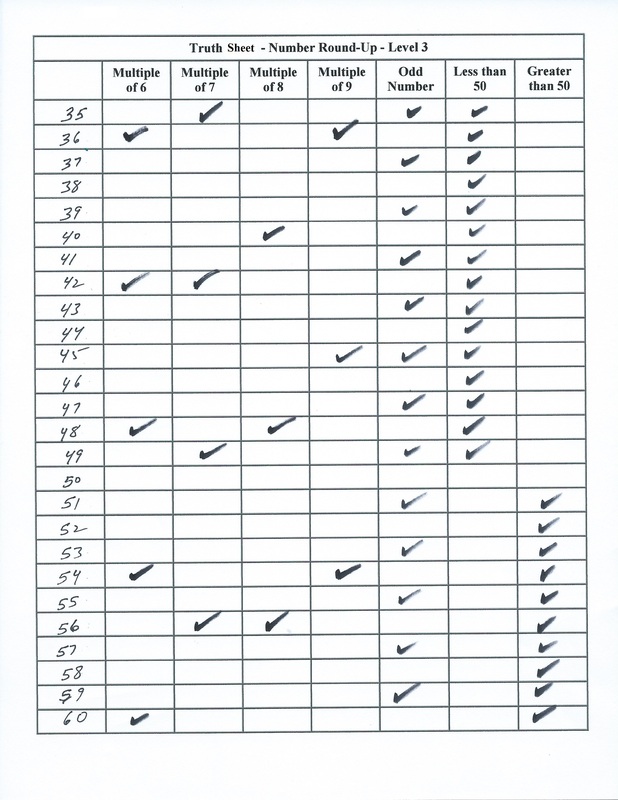 Prepare and print a "Truth Sheet" for any Number Round-Up Level. Fill the first column with counting numbers from any part of the number line. Next fill in the table with checkmarks in the spaces where the column description is true for that number row. The study of arithmetic is largely an effort to explore and understand the relations between numbers. Some interesting patterns may be revealed. Click for a larger view in a new window or tab. The sheet will launch in a new window or tab. Notes: Each sheet will have 25 lines. Your Custom Challenge corral name row will be blank. Are there more "Count by 10" numbers between 1 and 100 or more "Count by 5" numbers? Is there a number that is not "Less than 50" and not "Greater than 50"? Are there any "Count by 10" numbers that are not "Count by 5" numbers? Are there any "Odd Numbers" in the "Count by 10" set? In the "Count by 5" set? What about "Even Numbers"? Are there any "Multiples of 2" that are not "Multiples of 4"? Are there any "Multiples of 4" that are not "Multiples of 2"? What's the greatest number you can send into the corrals that is both a "Multiple of 5" and a "Multiple of 4"? What's the smallest number you can send into the corrals that is both a "Multiple of 5" and a "Multiple of 4"? How did you figure out that out? Could a number that is both a "Multiple of 5" and a "Multiple of 3" be an "Even Number"? Could a number that is both a "Multiple of 6" and a "Multiple of 7" be an "Odd Number"? How about a "Multiple of 7" and a "Multiple of 9"? What's the largest "Multiple of 9" that is also "Less than 50"? What number is both a "Multiple of 9" and a "Multiple of 7" that is also "Less than 50"? How many numbers are both a "Multple of 8" and a "Multiple of 6" between 1 and 100? Not sure? You could fill out some Level 3 Truth Sheets. Another way to research this answer would be to set up a Custom Challenge using "Multiple of 6" and "Multiple of 8" among the corral names and 6 horses for each player (12 horses). Then play Wranglers and send every "Multiple of 8" from 1 to 100. The numbers that are also "Multiple of 6" will belong in the Intersection. Can you think of ways to set up Custom Challenges to research these questions? You've had a workout with multiples and divisibility in the Herding Challenge. Take a look at this fun tutorial on divisibility from Khan Academy. You could fill out a Herding Challenge Truth Sheet for some BIG numbers with those quick tests! The Open Range Challenge is especially tricky when you play the Ribbons Round. Make a Truth Sheet for the Open Range Challenge to test a variety of numbers from 1 to 100. Most of the numbers will get 4 check marks. But a few will only get 3. Can you predict which numbers will only get 3 checks? List the numbers that can go in the Intersection when the Corrals are "Greater than 10" and "Greater than 90". Now you've been playing with "Square Number" and "Prime Number" added to the game. How many "Square Numbers" are in the game (from 1 to 100)? How many are also "Less than 50"? Is every "Square Number" also an "Even Number"? To score well in this Ribbons Round it helps to know the greatest "Prime Number" under 100. Can you name it? Also, what is the greatest "Prime Number" under 50? Is every "Prime Number" also an "Odd Number"? Is any "Prime Number" also a "Square Number"? Here's another video from Khan Academy. This one explains Prime Numbers. You may set up a Custom Challenge to do research on any of the questions above. Discover something about odds and evens. If your student is just beginning to learn their multiplication tables, set up a challenge with just the tables they're learning now and jump to it. Flash cards are helpful, but Number Round-Up is more than memorization. You may want to offer more or fewer horses for Wranglers, Mystery Round-Up and Ribbons for Your Custom Challenge. Using 6 horses allows for a lot of practice as well as high scores. If you come up with an interesting Custom Challenge, let us know. Post your idea in the Google Discussion Group to share with other players, parents and teachers. Play "Make Friends with a Number" any time. This game is for at least two players so it can work as a car-trip-travel game, but an entire classroom could also play. It is similar to 20 Questions. Each player prepares for the game by secretly choosing a counting number from 1 to 100. They make friends with their number by carefully thinking about it's attributes: Is it odd or even? What are it's factors? If the players are familiar with primes and squares, they should check if their number fits those categories. When it's time to play the game, the first player announces "I've made friends with a number. Can you guess what it is?" The other players ask yes-or-no questions such as "Is it greater than 25? ", "Is it an odd number?" and "Is it a multiple of 5?". When a player believes they know the number, it's time to guess. 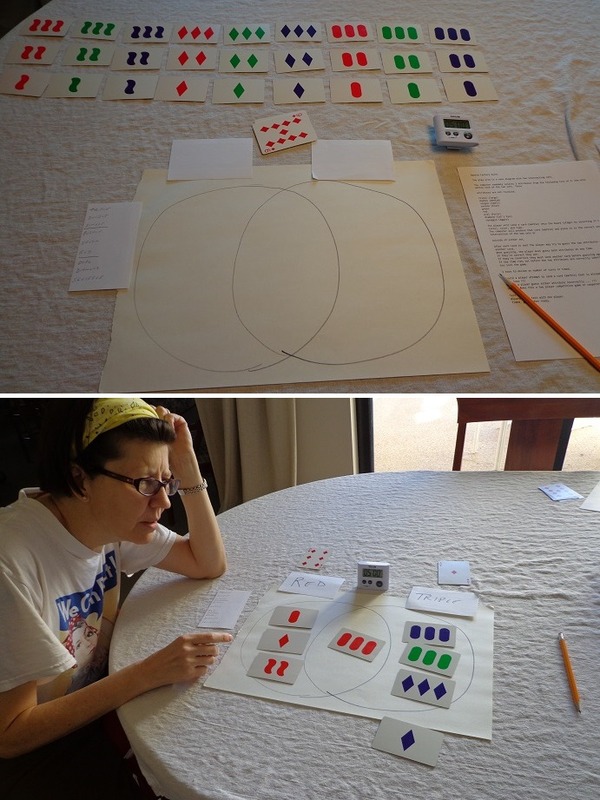 Players will become more and more efficient with their questions as they catch on to the deductive logic of the game. This game allows for some moving around. It's for two to 4 or 5 players. You'll need two long pieces of yarn or string or a really large sheet of paper, a pencil and pad of paper. Begin by making two intersecting rings on your table using circles of yarn or string or draw them on that sheet of paper. One player is the Wrangler and the others are the Buckaroos. I suggest that a parent be the Wrangler for the first round. The Wrangler must think of a one-word attribute for each yarn ring. These are kept secret and the Buckaroos will try to guess them. The Wrangler should write them down and put them in a pocket. To start the game the Wrangler places some object from the kitchen in one area INSIDE the rings (Left, Intersection or Right). Perhaps a plastic fork goes in the right area. Then, one at a time the Buckaroos go and get objects and hand them to the Wrangler. The Wrangler places each object where it belongs inside or outside the rings. Perhaps another fork is presented BUT it's placed outside the rings. OH! it's a metal fork. There's a clue. How about trying a plastic cup? After each Buckaroo has presented an object to the Wrangler, it's the Wrangler's turn to get something to place in another area of the rings. Buckaroos may guess the secret attributes at any time. The one who guesses correctly gets to be Wrangler next. Once there are 10 objects on the table without a correct guess,the Wrangler must reveal the secret attributes. Some good ideas for attributes easily found in many kitchens are: wooden, plastic, metal, paper, cup, spoon, fork, towel, bowl, container, flat, round, glass, etc. This game should be good fun even if someone puts a spork, a jar of pickles and the cat on the table. Set, a great card game for families. Set is an award-winning, card game for ages 6 to adult from Set Enterprises, Inc. The cards could even be used in a String Game as seen here.